Have you ever wondered how your organization could add your geospatial data, such as aerial imagery or places of interest, to Google Maps and Google Earth? Maybe you're using the Google Maps API and want to enrich our basemap with your own data. Or perhaps you'd just like to expand the reach of your organization's investment in GIS (geospatial information systems) by putting this data in places where people in your community are more likely to encounter it. You are not alone. Some of us in Google's Public Sector Content Partnerships team attended the recent ESRI International User Conference where we met hundreds of local government GIS managers and others who eat, sleep and breathe GIS data. There was one comment we heard over and over: "We'd like to share data with Google, but we don't know how to contact anyone there." Earlier this year we introduced the Cities in 3D Program through which we invite local governments, community groups and educational institutions to take ownership of the 3D representation of their community on Google Earth. In a video tour of "Cities in 3D"and case studies of successful 3D modeling projects, this site makes the case for producing and sharing 3D models as a tool for planning and economic development, for fostering tourism or merely to simplify navigation. The site, which was recently made available in multiple European languages, also explains the steps toundertaking a 3D modeling project and includes a spec of the various data formats we welcome. And, of course, the Cities in 3D program site includes a contact form where an organization can tell us about 3D data (as well as aerial imagery and terrain data) they'd like to share. Another example of how we're opening the door to making GIS data available to Google users is the Voting Information Project. Google is a founding partner in this initiative to make it easier for voters in the U.S. to find information online about registering to vote, locating a polling place, and knowing what to expect when you get there. Thanks to data shared by election officials in a growing number of jurisdictions, we're now able to point voters to their polling place on Google Maps and provide other relevant voting info. So, the door is open. If your organization has 3D data to share, or would be interested in learning how to produce a 3D model of your community, we'd like to hear from you. 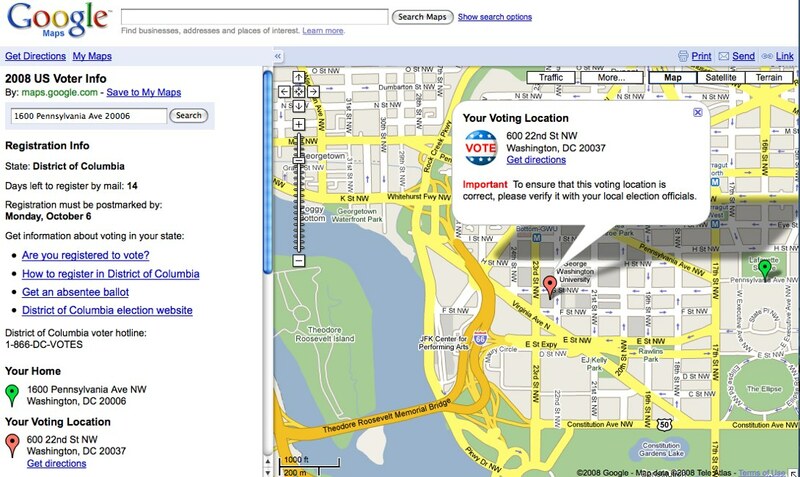 If your organization provides official election information, including polling places, and you would like to ensure voters in your jurisdiction can readily find this info on Google Maps, check out the Voting Information Project's open format for election data sharing and let the VIP team know what you have to offer. And if you've got other GIS data types to share, just tell us about your interest at gisdata@google.com or stay tuned to the Content Central blog as we offer additional information about how to add your GIS data to Google services.